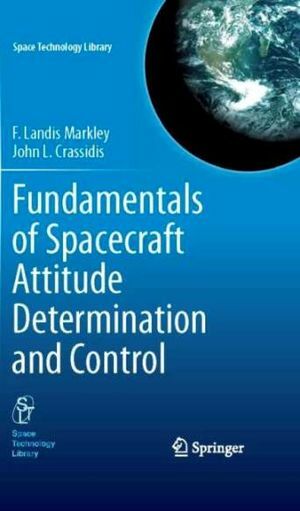 Fundamentals of Spacecraft Attitude Determination and Control provides the fundamental concepts and mathematical basis for spacecraft attitude determination and control. It is intended to serve as both a textbook for undergraduate and graduate students and as a reference guide for practicing professionals. A primary motivation of this text is to develop the theory of attitude determination from first principles to practical algorithms, because very few of the existing texts on spacecraft control treat spacecraft attitude determination in depth. We emphasize specific applications so the reader can understand how the derived theory is applied to actual orbiting spacecraft. We also highlight some simplified analytical expressions that can serve as first cut analyses for more detailed studies and are especially important in the initial design phase of a spacecraft attitude determination and control system. All of the examples shown in the text have been programmed and simulated using MATLAB. It has been our experience that to thoroughly understand the intricacies of a subject as diverse as spacecraft attitude determination and control theory, one must learn from basic fundamentals first. Although computer routines can provide some insights to the subject, we feel that they may hinder rigorous theoretical studies that are required to properly comprehend the material. Therefore, we strongly encourage students to program their own computer routines, using the codes provided from this website for verification purposes only. If you have any comments or corrections, please feel free to email the authors. The MATLAB codes are sorted by chapter and by example number. Each example file provides a list of other files that must be downloaded as well. Limit of Liability/Disclaimer of Warranty: The computer programs are provided as a service to readers. While the authors have used their best efforts in preparing these programs, they make no representation or warranties with respect to the accuracy or completeness of the programs. The book publisher (Springer), the authors, the authors' employers, or MathWorks, Inc. shall not be liable for any loss of profit or any other commercial or noncommercial damages, including, but not limited to, special, incidental, consequential, or other damages.